Stansted is the fourth busiest airport in the UK. 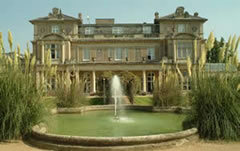 Located in Essex, not far from both London and the Hertfordshire border. Do you want to start your holiday in style? Perhaps you have a night flight? Whatever your situation is you may want to book a night in one of the available Stansted Airport hotels. Finding the right Stansted Airport hotel is easy with UKACP, fast, effecient, secure and we also save you money. What can we do for you? Search Feature – Our search feature allows you to enter all of the details about your requirements. We will then present you with suitable hotels. You can order the list based on price, star rating or whatever is important to you. Information – We provide you with all of the details you need about every hotel. This puts you in the best position to find the right hotel for your requirements. Videos – We even have video guides and walkthroughs for a lot of the hotels on our website. Pre-Booking – With a few clicks you can pre-book your hotel for ultimate convenience. We will save you a huge chunk of money in the process as well! Make your holiday one to remember by kicking things off at Radisson Blu. This is a modern and stylish hotel, which has four-star facilities. If you are a wine drinker you will be in heaven. The hotel has a wine tower, which is 13m high and features 4000 bottles. Just be careful that this doesn’t inspire you to try and drink as many. Three restaurant, free wifi and flatscreen Tvs in the rooms all add to the attraction of this four-star hotel. There are plenty of great family friendly hotels, such as Manor Hotel which have some rooms which can accommodate two double beds and the Holiday Inn Express. The Holiday Inn has comfortable rooms with blackout curtains, ensuring you can all get a good night’s sleep before the day of travelling ahead. It also offers free breakfast, wifi and has Sky TV in the restaurant area. 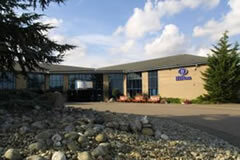 If you are looking for a Stansted Airport hotel with parking you may want to consider Days Inn Hotel or Ramada. You will be able to park your car in the Stansted Long Stay car park, whilst transfers run every 15 minutes, 24 hours a day. Other hotels with a convenient transfer service include the likes of Warman’s Barn, Stansted Hilton, DeSalis Hotel and Stansted Skyline Hotel. Some of these do charge and some are free. You can get full details by simply clicking on the blue banner below to view a full list of hotels with details. Hotels with good disabled facilities and rooms include Ramada, Radisson Blu, Stansted Hilton and DeSalis Hotel. These hotels offer specially adapted rooms with helpful facilities such as lowered light switches, emergency pull cords and wet rooms. Don't forget that if you decide not to stay in a hotel the night before you fly you can still save money on our Stansted airport parking packages. We will always save you anything from 15 to 60% compared to the car park gate price.